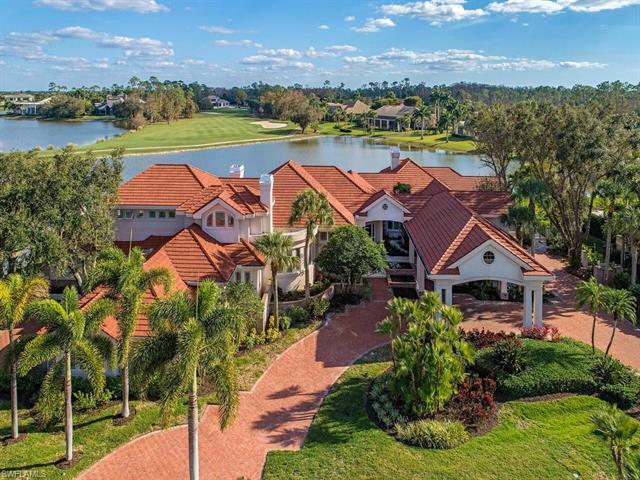 H.14281 - Premier Quail West views and location plus FULL GOLF MEMBERSHIP WITH ASSESSMENT PAID INCLUDED!This estate home offers long sweeping vistas of two lakes, 1st hole Preserve course from tee to green clubhouse and more! Spectacular views from sunrise to sunset capture your attention from every angle in this spacious, quality built London Bay home.Designed by Stofft & Cooney, the estate offers a thoughtful floor plan for comfortable living and entertaining.The Master wing is a private enclave with morning bar, private laundry, his/her water closets and sunroom perfect for yoga and/or exercise equipment. Nearby are a mahogany paneled library, separate office and media/theater room.A second master suite upstairs walks out to a covered lanai with stunning views & private entrance.Two add'l ensuite bedrooms and attached cabana with a/c, fireplace, bath & retractable glass walls offer many options for owners and guests to stay or lounge.UNIQUE FEATURES:1000 Bottle wine cellar, formal dining room with butlerâs pantry, reading nook with fireplace, infinity pool, spa, covered portico and two 2-car garages.This distinctive home with its breathtaking views offers a rare opportunity and value!